Boost your reading rate and comprehension for increased confidence and improved results. Programs are also available to apply speed-reading and comprehension skills to the reading and writing sections of most standardized tests. Please contact me to discuss how we can work together to quickly accomplish your personal reading goals. How much improvement can you expect? Average students more than triple their reading effectiveness—a combination of rate and comprehension. How quickly will you see improvement? You should see major progress by the end of the second session. Establish starting rates and comprehension. Plan a program that's best for you. I will create a customized program to improve your reading speed and comprehension. You will also receive a detailed analysis of your strongest intelligences and learning styles and how to use them. I offer a substantially lower rate per person for small groups of 2 to 3 people. If you have fellow students, peers, friends, or siblings who are interested in learning speed-reading, you can form your own small group. I do not organize groups for clients. I design and lead speed-reading workshops for schools and organizations that sponsor them. The sponsor provides both the location and the participants. Workshop participants who do the recommended outside work frequently triple their reading effectiveness by the end of the workshop or shortly thereafter. Over my three decades of teaching and tutoring, I have written guides that produce optimal results for clients in the accelerated timeframes of my programs. I continually update and improve these guides based on the latest research, professional reading, and helpful suggestions from students. Located on 28th Street between Dolores and Guerrero in Noe Valley, San Francisco. Remote tutoring options are available via Skype, FaceTime, and more. Tutoring at your location is available for an additional fee. Travel and prep time is billed at my normal hourly rate. Contact me for details at (415) 821-6595. What is the time frame for tutoring? 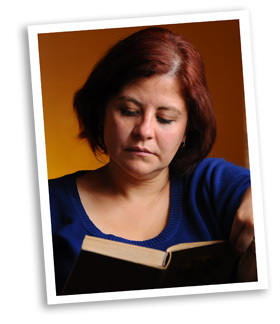 Speed-reading clients usually spend 6 hours working with me, ideally over the course of two or three weeks. Clients usually meet with me for a 2-hour session each week, but other session-lengths and time frames can be arranged. For maximum benefit, supplement the tutoring with at least 6 hours of outside work, so you can soon apply your newly acquired skills to your own materials. Ongoing practice and application are necessary to make your new reading skills permanent. If you also need assistance with standardized test prep, study and learning skills, grammar, writing, and/or vocabulary, that will require additional hours. Ongoing assistance is available, applying reading and learning skills to your materials and assignments. All prices are for cash, check, or money order.